No. 15/16 Virginia Tech blew a 14-point halftime lead in a 73-64 overtime loss to No. 14/13 Florida State on Tuesday night in Tallahassee. The Hokies dropped to 22-7 overall and 11-6 in the ACC with the loss, while the Seminoles improved to 24-6 overall and 12-5 in league play. The ‘Noles are now 49-3 in their last 52 home games, and they clinched the No. 4 seed and the double bye in next week’s ACC Tournament. Tech will most likely be the No. 5 seed in the tournament, which means a rematch with Florida State could be coming next Thursday. The Hokies dominated the first half, leading 33-19 at the halftime intermission. Playing at home with five seniors on Senior Night, Florida State immediately got back into the game in the second half and cut into Virginia Tech’s lead. Their rally started on the defensive end, where they made it more difficult for the Hokies to move the ball and get good shots. By the 14:18 mark of the second half, Florida State had cut Virginia Tech’s lead to 41-37. That’s when disaster struck for the Hokies. Kerry Blackshear was whistled for his third foul, a questionable charging call, and he went to the bench. 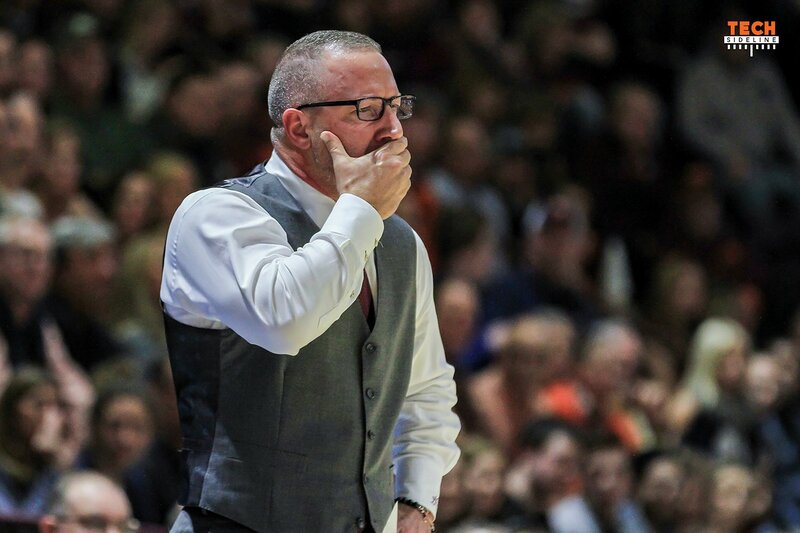 Buzz Williams tried to use him on offense while substituting him out on defense, but that backfired as the Hokies turned the ball over and Blackshear had to stay in on defense. FSU immediately went inside and drew a fourth foul with Tech up 41-40, and Blackshear went right back to the bench. The Seminoles went on take the lead, getting up 46-41 with 10:51 before Tech came back and tied the game at 46. The game stayed close, and Florida State led 57-54 when Blackshear, back in the game, picked up his fifth foul with 2:46 remaining. His night was done, and two more FSU free throws increased their lead to 59-54. Tech showed resiliency down the stretch by keeping the game close despite being out-manned, and they managed to force overtime on a big three-pointer by Ahmed Hill with just eight seconds remaining. That made the score 61-61. FSU guard Terance Mann missed a three-pointer at the buzzer that would have won it in regulation for the Seminoles. Virginia Tech scored the first point of overtime – a free throw from Ahmed Hill – but that was to be their final lead of the game, as the deeper Seminole squad eventually took control against the Hokies. Blackshear, who dominated the month of February for Virginia Tech, played just 23 of the 45 minutes against Florida State. He had nine points, five rebounds and four assists. Tech outshot Florida State 41.5% to 37.9%, including 29.6% to 27.8% from three-point range. The Hokies forced the Seminoles into 36 three-point attempts (they only made 10 of them) because they did a good job of keeping the ball out of the paint. However, Florida State had five more overall field goal attempts and seven more free throw attempts than Tech, mostly because of that turnover difference. Both teams did a good job at the free throw line, with the Hokies going 12-of-15 (80%) and the Seminoles going 19-of-22 (86.4%). Nickeil Alexander-Walker led the Hokies with 19 points. He was 7-of-17 from the field. Ahmed Hill had 18 points and nine rebounds, and he was 6-of-12 from the field and 3-of-6 from the outside. Ty Outlaw chipped in with 10 points, and Wabissa Bede had six points and eight rebounds. However, the Hokies got just two points from their bench, and that basket came late in overtime by PJ Horne after the outcome was already decided. Virginia Tech returns to action on Friday night for their final regular season game against Miami in Cassell Coliseum, where the curtain will drop on the home careers of seniors Ahmed Hill, Ty Outlaw and Justin Robinson, though it isn’t for certain that Robinson will be able to play. Tipoff is scheduled for 7pm, and the game will be televised nationally by ESPN2. Another great effort by this gutsy team, but fatigue was the enemy at the end. I totally agree with several posters that several of the fouls called against VT were horrible. Still, if we have 1 or 2 less turnovers in the second half and hit 1 or 2 more foul shots, the game doesn’t go to OT and VT is the 4th seed in the ACC Tournament. P.S. I always told my players that they can’t control what the refs call; however, they can control how much the other team scores and how many balls they put through the hoop. Lots of lessons to be learned. Impressed we forced OT. We could’ve collapsed at the end of regulation but we fought tough. Couldn’t score in OT. Credit to the FSU D & their depth. Believe there’s a silver lining since we can now afford to keep JRob out for the rest of the regular season. Though I wonder if he’ll dress out for Senior night. If JRob can play in the ACC Tourney, we’ll have a warmup game before our rematch with FSU, assuming we land the 5 seed. KJ can rewatch the film to better manage his reaction to bad calls and improve his EQ heading into the postseason. Buzz was surprisingly upbeat in the postgame interview so if he’s feeling good about things then I’m feeling good. Gotta think like Buzz and ask why did this happen for us, rather than why did this happen to us. Go Hokies! I read article and the comments that followed and my perspective of what I saw was a bit different from most. Buzz did his part bringing a great game plan to Tallahassee and 60% of the players on the court did their jobs too but darn it…..two of the 5 players on the court last night really let their team down in the 2nd half IMO. Both of our star players need to return for another year. This season, I have never been more disappointed of an opportunity lost than last night…..this includes the game we squandered to UNC after also leading them by double digits. In my opinion, Blackshear & NAW both played out of character and out of control and when they review their game film I hope they honestly identify that their play destroyed the Hokie’s chances to earn a double-bye lastnight. Blackshear (the floor leader) was out of control and never let the game calmly come to him. And those stupid fouls with the grin that follows; He was pressing too aggressively when he never had too especially when you are up 14+ points. Some times its better to offer less resistance on the Defensive side rather than risk a foul. Blackshear sometimes reminds me of Jeff Smith who was a good Virginia Tech player when he just simply played his game without any of the foul-who-me shenanigans. You look foolish with low basketball IQ when you collect multiple fouls for the same dumb plays throughout the duration of the game then sit on the bench in smiles like you did good work for the night. Blackshear let his team down; especially when your not available for the extended Overtime play. It was like a few Hokies felt they needed to show high intensity and aggression to project an image that they were into the game and determined to win the game. Perhaps Blackshear was caught up in the fact he was back in his home state and wanted to show toughness rather than the silky smooth “Tim Duncan-like” Blackshear that we are accustomed to. N-Alexander Walker was also flawed last night. Will this guy stop making bad errant passes with 5% probability rate of arriving to its intended target. He repeatedly wastes possessions unnecessarily- Its ridiculous. How many bad 3 balls or long-distant shots did NAW take only a few seconds into the shot clock? NAW often runs no offensive sets when he is running the point- why is Buzz letting him play NBA isolation basketball….he’s not that consistently good (yet)? The game came unraveled because of the play of these two which led to fast breaks in the opposite direction, offensive charges in the opposite direction, turnovers in the opposite direction, points at the free throw line in the opposite direction, and less chances to set up your vaulted full court press after made baskets on the offensive side of the ball. Those two got us completely away from the formula style of play we know Buzz and this team need to follow to achieve success. Once the avalanche started, neither player nor their teammates could stop the damage coming their way. I hope J-Rob can return and restore balance to the force. I hope he too doesn’t try to do too much and steers clear of playing to the refs and feeding too much into court dramatics. At this point, The lack of the double bye can help J-Rob get his stamina back. I love these guys but I got frustrated last night watching. This team can win this tournament if they just stick to playing their game and their strengths and not trying to overcompensate for the areas they lack. You make some good points especially about NAW passes and forced shots. He is cagy but does not have the ability to beat defenders off the dribble. I noticed that in this game and the UVA game our reserves (Wilkins last night and Wilkins and Kabongo in UVA game) are left alone in the corner on offense and the starters won’t give them the ball. Wilkins was visibly frustrated last night (a little childish I think but maybe warranted). I think they’ve both proven they can hit shots and Wilkins can dribble by his defender if he runs out on him. Our outside shooting % deteriorates in the 2nd half and it’s likely fatigue. It’s our low shooting % that is costing us games. I assume Buzz can see this too and maybe he doesn’t want freshman shooting. But, they are the ones with the fresh legs. I would like to give them some more shots. Buzz is always talking about “trusting each other”. I don’t see that trust in the freshman from the starters. Still, if I am honest, the team without Robinson has exceeded my expectations. We came close to pulling off a miracle and securing the double bye. Hopefully we don’t have a Greenberg last game of the year let down and take care of Miami. That would make us 6-4 without JR. I don’t see how JR can be in game shape after one tournament game though. People keep talking about JR playing the ACC Tourney. Is that official? I figured the ref room got a Greensboro hotline call during halftime. Read all the above comments with interest, but the simple fact is this: when has VT Men’s BB had a full bench with scholarship players suited up and ready to play. It is a chronic problem for VT & Buzz sure had not been able to fix it either. Injuries, suspensions, ineligibility, transfers all contribute to “any” VT team suffering from exhaustion at this point in the season. It is a song that is getting old!! The effort by the 5 starters last night was awesome- Buzz should feel badly that he did not give them a full bench to allow them to win. I blame this on VT Coaches and Administration, not the 5 players giving it their all last night. I’m not sure what part you can blame on Buzz? The administration? An eligibility issue, a suspension and an injury. There is no coach/admin that can “fix” these things. Also we played 7 players. Only Kabongo didn’t play of the active scholarship players. It’s the head coach’s responsibility to build and maintain a competitive roster via recruiting, player development, and retention. Let’s get to the big dance and see what a non ACC officiating crew has to say. I’m tired of the old guard tobacco road bias. Doubt it, been that way ever since we joined the ACC. I think FSU would laugh at the thought that they were the benefit of tobacco road bias. Gutsy performance. Our lack of size and depth did us in, along with 2-3 questionable fouls called on Blackshear. After Blackshear and the FSU player got into their confrontation, the refs seem to focus more on Blackshear. Buzz and the boys almost pulled it out. After Blackshear fouled out, I thought FSU was going to skate to an easy win but our guys never quit. That 4th seed would’ve been nice. I just wonder how good this team would’ve been with Clarke, a healthy Robinson and Horne, and Nolley on the roster for the entire season. Let’s hope Robinson gets back in time for the ACCMBBT. It would be great to see Robinson play vs. Miami in his final home game. Don’t forget the horrendous foul called on PJ Horne that cost us a possession late. Despite having no bench to speak of this VT team had this game stolen from them by the Refs. Great effort from everyone. We are a really good team. Yes, we blew a fourteen point lead but after FSU caught up, but we regrouped and played them even…we didn’t simply fold. Not too shabby for a road game. Team played hard and had a great chance to win. I was expecting a blow out win by Florida State. If a productive Robison returns I like our chances in a 4/5 rematch during the ACC tournament. Oh what sweet revenge that would be. It’s still a historic year for Hokie basketball. Let’s Go…beat Miami. If we go into the ACC tourney as a #5 seed, win our first game, play #4 seed FSU again and beat them, we probably won’t be concerned about last night’s loss. The last two fouls on Blackshear were non-existent from my perspective. The 3rd foul charge was the worst. The fifth foul was stupid on his part and was probably a good call. All 3 were awful, and the lady commentator calling the game disagreed w the call on all 3 of them. You rarely get espn commentators disagree with calls, because it is a bad look on an agreement they have with a conference..but she was vocal of all 3. The charge (3) was a block…commentator even said that the shoulder didn’t drop and it was an in-control basketball drive vs poor position. 4th foul was no contact whatsoever, and Blackshear (for the 1st time) kept his hands up and should have been protected by the rule of verticality. 5th foul it was noted, he had proper box out, was 2 hand shoved on the shot release, he regained positon and was called for being in position to rebound (where the next 3 times down the floor their big did the same thing and they never called VT on anything). Unfortunately when Horne comes in we get a negative offensive player that gives zero pts, turns the ball over and can’t catch. With him abd Bede, you have 2 of 5 that you don’t have to honor at the 3 pt line (or really worry about scoring much) and it kills the offense because they can pack the paint off of those 2 guys and close hard on the other 3. I like Bede, but that is just the reality of those 2. Agree with this. Bede and Horne are still developing. Playing hard but sometimes in over their respective heads. The bogus fouls on KB did us in, forcing Buzz’s hand wrt personnel. the refs did a poor job on calling this game. I agree with others. the calls and NO CALLS were a disgrace. they called 4 charges against tech in first 10 minutes of second half. when the announcers say the refs missed it. looked like the Notre Dame Refs playing at ND. worst called game I have seen this year . NAW got fouled by two different Fl St players on his drive in regulation that did not get called. Turned out to be the difference in the game. That was no where close to the difference in the game. The difference was we don’t have the size and depth to play toe to toe with a team that does have both size and depth,,especially when our only inside presence is sitting on the bench in foul trouble, and or primary ball handler and assist leader is out of action. The refs didn’t help our cause but we don’t have the horses to be short-handed against bigger/deeper teams and still have a better than average chance of winning when we are turning the ball over and shooting below 30% from 3 point range. If we had played better than FSU we would have won. The refs didn’t cost us this game. you can take the high road and not blame the 🦓🦓🦓 all you want, the fact was the 3rd and 4th fouls on blackshear were phantom. the tape doesn’t lie. that’s 40% of his fouls allowed. that would have been at least 4 to 8 minutes more of floor time for blackshear. I was there and u don’t know what u are talking about. With 3 minutes left in first half the reliable ACC refs decided to GET INVOLVED into what had been a BEAUTIFUL game of basketball- with contact but FSU initiated most of it. With 5 in last night we snub those playground wonders going away- not even close. What about the offensive foul called on Horne when all he did was stand in the spot he already had established and the F$U player ran into him? This game was tied at the end of regulation with us playing 5 on 8 (including the 3 refs). That has nothing to do with bench depth or player size. That has everything to do with talent, heart, and team chemistry which this VT team has in abundance. Blackshear plays 23 out of a possible 45 and you say the refs didn’t cost us the game. I would be willing to bet that Blackshear played the biggest majority of his minutes in 1st half. He scores, rebounds and finds open guys on the perimeter. I Agree that Fla State came out played lights out to start the second half, but refs helped out from there with those “REC LEAGUE” calls on Blackshear keeping him where they wanted him. Granted we need a deeper bench, but you can’t blame that on coach. Sy leaves comes back leaves again, as far as Clarke the fact that Coach holds them to a higher standard should be something that VT fans take pride in. Nolley, ncaa, lower case on purpose, enough said. You’re talking globally, not in the sense of this game. I would also like to have size and depth, but we play with what we have. If they had called the foul on NAW we probably win – same as if PJ had caught the ball for a sure layup which turned into a 4 point swing when FSU scored on the other side. If the officiating in that game was close to even then we win – regardless of all of the other stuff you bring up. We got jobbed a little by the refs for sure, but that’s what happens when you play on the road in the ACC. I’m still amazed that the refs were as even as they were during the Duke game. That wasn’t the only blatant foul that wasn’t called on FSU’s defense. I feel bad for Blackshear, I thought he had a couple of questionable calls go against him. The game got a bit more physical in the second half and we did not get many breaks. We were not going to win without him, but what a great effort by the team as a whole. It has to be tough on the players when the officiating becomes so inconsistent both within the game and from game to game. We are going to see FSU again, and I hope a Hokie win will be more meaningful. Let’s beat Miami and move on to better things. If calls do actually even out over the year, we are in great shape.